Warren County was established by the Illinois Legislature in the 1824-25 session. The original Warren County extended to the Mississippi and included what is now Henderson County. In 1830 Warren County was able to prove that they had the 350 inhabitants necessary to create a governing body. The county seat location was decided upon and land that is now Monmouth was surveyed and divided into lots and auctioned in 1831. Henderson County split from Warren in 1840 in part due to disputes over the location of the county seat. 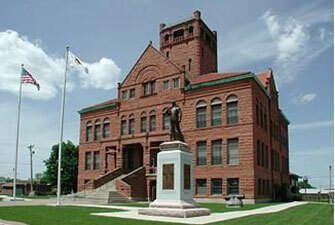 The current Warren County Courthouse is actually the 4th county courthouse. The third county courthouse was located on what is now the front lawn of the current courthouse. It was in this 3rd courthouse that in June of 1841 the Mormon Prophet Joseph Smith was brought before the judge for an extradition hearing. Missouri wanted to extradite Smith to face murder charges. Smith wasn't the only famous figure involved; Stephen Douglas who would later become one half of the famous Lincoln Douglas debates was the judge overseeing the hearing. There is also some evidence to suggest that Lincoln himself while not present for the hearing did some work on the case for the prosecution.